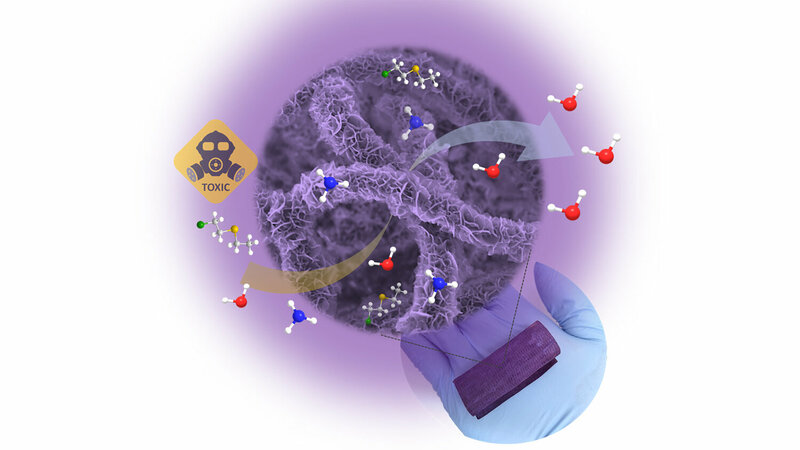 A new coating for textile fibers shows promise for efficiently capturing toxic industrial chemicals and chemical warfare agents under real-world conditions, including high humidity. The research could lead to improved masks and personal protective equipment for soldiers and others at risk of exposure. Researchers at North Carolina State University and the U.S. Army's Combat Capabilities Development Command Chemical Biological Center (CCDC CBC) developed functional textiles that neutralized a blistering agent simulant under conditions of 80 percent relative humidity. The new coating also captured ammonia gas, a commonly produced industrial chemical in the U.S.
"For more than a century, we've had threats from chemical warfare agents, from chlorine and mustard gas in World War I to recent attacks against civilians in Syria," says Dennis T. Lee, a recent Ph.D. recipient at NC State and lead author of an article about the work. "We need to find ways to capture and chemically break down toxic gases for practical, better-performing protective equipment." Researchers worked with metal-organic frameworks (MOFs) – coatings that are synthesized over microfibers. There are two significant challenges. The first lies in creating MOFs that can remain stable in the presence of moisture while holding the hazardous compounds in a thin film, a process known as adsorption/absorption. The second is achieving a coating that's effective in degrading toxic chemicals. The team created a water-stable copper (Cu)-based MOF film. Instead of working with a powder source, researchers used a solid film deposited on the fiber, which captured three times more ammonia gas than the same MOF powder. Electron microscope images showed MOFs in crystal formations that grew out radially from the fiber – a distinctive shape that hadn't been previously reported. The MOFs bonded strongly with the surface of the polypropylene fibers, resisting flaking when handled in the lab and when swept with a nylon brush. "This alignment formed a dense coating on the fibers, with better integration and adhesion to the surface, and improved adsorptive performance for hazardous gases," Lee says. The new MOF-coated composites have potential to be used as a base film in protective textiles, Lee says. The method would also be suitable for use in smart textiles that have multiple functions, such as sensors, he adds. Future plans call for testing the new materials with real chemical warfare agents, working with U.S. Army experts at the CCDC CBC. The article, "Water-Stable Chemical-Protective Textiles via Euhedral Surface-Oriented 2-D Cu-TCPP Metal-Organic Frameworks," is published in the journal Small.